We’ve all been there. Conferences, that is, where the people one meets there and get to network with can range from the fun, synergistic sorts to the mundane, boring sorts. Many of those conference-goers would certainly fall into certain stereotypes. There are the entrepreneur types hoping to meet potential investors and pitching their product to whoever would listen, to the social media maven who’s there to broadcast event proceedings (and their involvement). 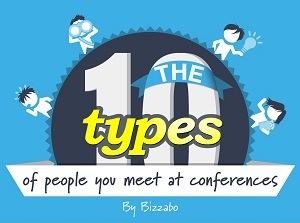 Here’s an infographic from event networking and business discovery app Bizzabo that reveals the ten stereotypes who are always present at conferences. Which one are you?